Okay, enough. 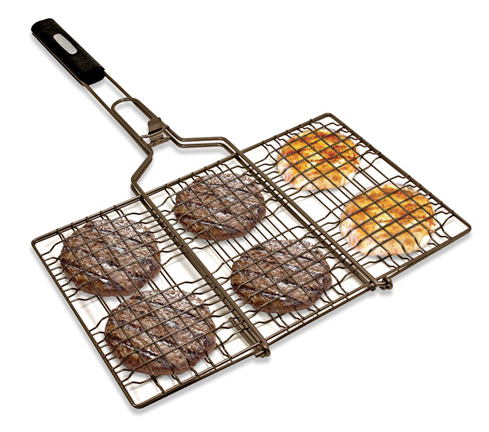 Grill baskets are great, but when we start making them for hamburgers, well then that’s when it has gone too far. There are those grill grates sitting there after all. Usually. Most of the time. Not always when camping, I guess. Or at a bonfire. And those grates at the park can be kind of nasty, I suppose… All right, you win Cuisinart Hamburger Basket, I take it back. You can exist. Even if it’s just to show that more than just hot dogs and marshmallows can be held over a campfire. ***UPDATE 7/10/15*** Well, looks like Cuisinart got hungry for something else — the product link above was outdated. The good news is they have a basket for grilling more than just burgers now. Now all your food can enjoy the grill with the Cuisinart Simply Grilling Nonstick Grilling Basket .